12.1897 in collision with steamer OBRA, owned by British India Steam Navigation Co., at Garden House Point in River Hooghly on a voyage from UK to Calcutta with general cargo. 1922 sold to Hokuyo Kisen Kabushiki Kaisha, Japan and renamed HOKWO MARU. 1928 sold to shipbreakers. IN the matter of a Formal Investigation held at the Magistrate's Room, Dale Street, Liverpool, on the 6th, 7th, 8th, 10th and 12th days of September, 1910, before JOHN KINGHORN, Esquire, Acting Stipendiary Magistrate, assisted by Captain W. B. BIGLEY, Captain D. DAVIES, and Captain W. J. SYMONS, R.N., into the circumstances under which the British sailing ship "HENRIETTA," of Truro (Official Number 68281), while at anchor near Formby Lightship, Queen's Channel, River Mersey, about 6.15 a.m. of the 21st November, 1909, was struck by the British steamship "CLAN MACDONALD," of Glasgow (Official Number 106067), and sunk, whereby loss of life ensued. The Court having carefully inquired into the circumstances attending the above-mentioned shipping casualty, finds for the reasons stated in the Annex hereto, that the collision and consequent sinking of the "Henrietta" and loss of life were caused by the want of a proper and efficient look-out on board the "Clan Macdonald" owing to the default of the pilot, Mr. Henry J. Manchester, the master, Mr. George Hayward, and the chief officer, Mr. Alexander Robertson, in carrying out their respective duties in connection with the navigation of their vessel. The Court hereby censures the pilot and the master, and severely censures the chief officer. Dated this 12th day of September, 1910. This was an Inquiry into the circumstances attending the collision between the s.s. "Clan Macdonald" and the schooner "Henrietta" in the River Mersey, whereby loss of life ensued, and was held at the Magistrate's Room, Dale Street, Liverpool, on the 6th, 7th, 8th, 10th and 12th days of September, 1910, before J. Kinghorn, Esquire, Acting Stipendiary Magistrate, assisted by Captain William Barnett Bigley, Captain David Davies, and Captain W. J. Symons, R.N., as nautical assessors. Mr. J. Paxton (Messrs. Avison & Co.) appeared for the Board of Trade, Mr. P. J. Taylor (Messrs. Miller, Taylor & Holme) for the master and chief officer of the "Clan Macdonald," and Mr. H. D. Bateson Messrs. Bateson, Warr & Wimshurst) for the owners of the "Clan Macdonald" and the pilot, Mr. Henry Manchester. Mr. A. M. Preston (Messrs. Weightman, Pedder & Weightman) watched the proceedings on behalf of the owners of the "Henrietta," and Captain Henry Honey of the "Henrietta" appeared in person. The "Henrietta," Official Number 68281, was a topsail schooner, built of wood, in 1872, by Mr. John Stephens at the Carnon Yard "Feock," Cornwall, her port of registry being Truro, and her dimensions were as follows : Length, 90 feet; breadth, 20 feet 9 inches; and depth, 11 feet 3 inches. She was carvel built, had one deck and two masts, and her registered tonnage was 91.70 tons. She was owned by Mr. William Langworthy Jenkin and nine others, Mr. William Langworthy Jenkin being appointed managing owner by advice from Caroline Jenkin, dated 10th October, 1892. She was well found with lifebuoys and lifebelts, and carried one 16-foot boat, stowed on her main hatch. The "Henrietta" left Parr, in the County of Cornwall, on the 1st November, 1909, with a crew of four hands all told, bound for Manchester with a cargo of china clay. After a protracted voyage she reached the Bar Lightship early on the morning of 21st November. When abreast of the Formby Lightship the wind died away, and as the ebb tide was running, the "Henrietta" anchored in a position N. by E. 200 yards distant from the Formby Lightship, veering about 10 fathoms of chain cable. Her head sails were run down, the topsail clewed up, and the tacks of the main and foresail triced up to the jaws of the gaffs. The regulation anchor lights were exhibited. Soon after this the master saw the masthead and sidelights of a steamer a little on his starboard bow, and thought she would pass clear of him. Shortly after, observing the steamer coming right for them, he and his crew commenced to shout and hail the steamer, but she still kept the same course and struck the "Henrietta" on the starboard bow, carrying away her bowsprit and cutting into her starboard side. The "Henrietta's" crew at once attempted to launch their boat over the port side, but the schooner getting a big list to starboard, they were unable to do so, and soon gave it up. 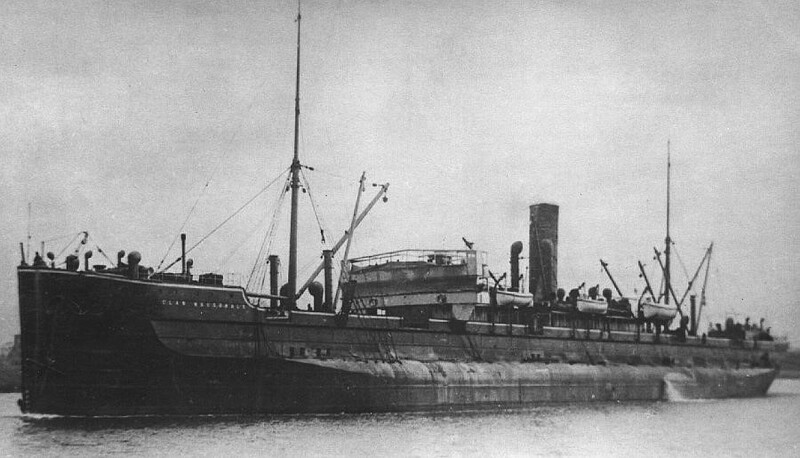 Meanwhile ropes had been put over the bows of the steamer (which proved to be the "Clan Macdonald"), and by these means the master and mate safely got on board the steamer, but the cook, Aldwyn Richards, got jambed between the vessels, and was so seriously injured that he had to be helped on board by the second officer of the steamer. The fourth hand, Alfred Lacey, A.B., was not seen after the master of the schooner left him standing near one of the steamer's ropes. The cook, Aldwyn Richards, was taken to hospital, where he died the following day. After the cook had been assisted on to the deck of the steamer, it was found that the fourth hand of the "Henrietta" was missing. The "Clan Macdonald's" boat was at once lowered, and cruised about in the vicinity for about three-quarters of an hour, calling also at the lightship, but nothing was seen or heard of the missing man. The master of the "Henrietta" stated that those on the steamer did everything they could to save life, and that five minutes after the collision the schooner disappeared. Upon his going to the bridge of the "Clan Macdonald" the pilot was on the starboard side and the captain on the port side, and he said to the pilot, "This is a pretty job, pilot," to which the pilot replied, "I heard you shout and saw your light, but not in time to starboard my helm." The pilot denies that this conversation took place. The evidence of the mate of the "Henrietta" as regards the collision agrees with the master's, with the exception that the mate states the crew were all on deck prior to the casualty, whereas the master said he shouted to the men who were below to come on deck. Mr. James McConnell, the master of the "Princess Louise," of Barrow, which left Annalong, County Down, on Friday, 19th November, 1909, stated that on the morning of the 21st November he came to anchor in the Formby Channel about five minutes before the "Henrietta." The "Princess Louise" was a little ahead of the Formby Lightship, distant about 200 yards, on the north side of the Channel between Q 6 and Q 5 buoys, closer if anything to Q 6 buoy, and pretty well in the fairway of the Channel. The "Henrietta" was at anchor 200 yards astern of him slightly more over in a line with the buoys Q 6 and Q 5 to the northward. He exhibited in position the required riding lights, several vessels passed him on the port side bound out, and he subsequently saw at a good distance the sidelights and masthead light of a steamer a little ahead, which after events proved to be the "Clan Macdonald." 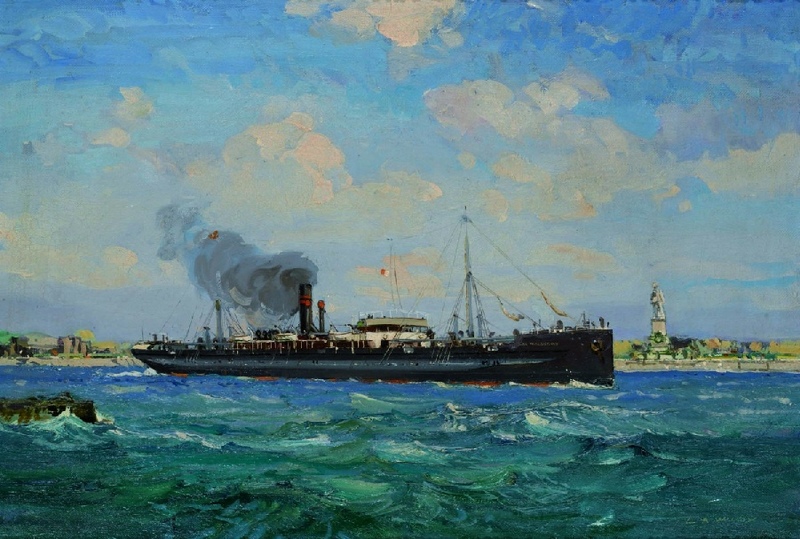 As the steamer still came on with her regulation lights still visible and drawing pretty near, he shouted, and the steamer then shut in her starboard light and passed the "Princess Louise" on the port side distant about 60 yards, thus indicating that she had ported her helm. Just after the steamer had passed them he heard shouting from the "Henrietta," and shortly after the crash of the collision. He was of opinion that for the steamer to have collided with the "Henrietta" after passing him she must have starboarded. Mr. John Taylor, first class Mersey pilot, and permanently attached to the Clan Line steamers, stated that he left the Birkenhead Dock about 5 o'clock the same morning in charge of the "Clan Stewart," also bound down the river, and as he approached the Formby Lightship at 5.45 a.m. he passed a schooner under weigh, and immediately afterwards heard shouting on his port bow. He at once put his helm hard-a-port and suddenly found himself alongside a vessel which appeared to be a schooner, with her foresail and mainsail set and topsail hauled up, and the only light visible was on the stern rail aft. He had. a narrow escape of collision, having grazed along her side, carrying away some of her braces. She had not, he alleged, her proper anchor lights up, and he had since discovered that the vessel was the schooner "Princess Louise." Henry Abraham, seaman on the Formby Lightship, stated that he was on watch from 4 to 6 o'clock on the morning of the collision, the wind being light and the weather clear but dark. At about 25 minutes to 6 a schooner came to anchor about 200 yards from the lightship. bearing N.E. by E., and about five minutes afterwards a second schooner dropped her anchor nearly abreast of them, bearing N. by E., distant about 200 yards. Both the schooners had their riding lights up and in their proper position and burning brightly. Some time before he left the deck at 6 o'clock he also noticed the "Henrietta's" mainsail and foresail slanting, that is, the tack hauled up to the jaws of the gaff, her topsail clewed up, and her headsails hauled down. The other schooner .the "Princess Louise," was in about the same condition. During his watch many steamers passed down the river on both sides of the schooners. Before leaving the deck he noticed that a steamer nearly came into collision with the "Princess Louise." The schooner's lights were visible at the time to him and ought to have been seen by the steamer. Edward Evans, seaman on the Formby Lightship, who relieved the last witness at 6 o'clock, confirms Abraham's evidence with regard to the position of both schooners from the lightship, the character of their lights and condition of their sails, From the time he came on deck till the collision, six outward bound steamers had safely passed the schooners, some to port and some to the starboard side of them. He saw the collision take place and observed the "Clan Macdonald" first approaching the "Princess Louise," and to clear that schooner she had to port her helm. This the pilot of the "Clan Macdonald" denies. Lieutenant J. Whitla Gracey, R.N.R., stated he was junior assistant marine surveyor and water bailiff to the Mersey Docks and Harbour Board. It was his duty to remove and destroy wrecks in the Mersey Fairway, and on Monday, 22nd November, the day after the collision, he proceeded to the wreck of the schooner "Henrietta" in the dock board tender "Vigilant," it having been located the day before and a watch vessel stationed there. Part of the foremast was above water, the cap of the lower mast being awash. It was a convenient time with a running out tide to take the masts out of her, and this was accordingly done. When the foremast was hoisted about 10 or 12 feet out of the water, he noticed a lamp hanging in the middle of the ropes and sails, and gave orders for it to be cut away. This was done by the seaman Matthews, but he could not say to what portion of the rigging it was attached. The spars were taken to the lay up at the Herculaneum Dock, and some time afterwards when visiting this place he carefully measured the mast and calculated the height of the lamp. This he found to be about 25 feet from the deck. The lamp, which was produced in Court, he examined and found that it contained oil and water; he removed a crust from the top of the wick which indicated that it had been recently used. The lenses of the lamp which were dioptric were in good order. It was a larger and very much better lamp than is usually carried by that class of vessel, and if properly trimmed should show a very good light. The head sails, some of which were right down and others partly down, would not if in that position at the time of collision have obscured the light. In removing the main-mast from the wreck he did not come across any after lamp. All the light vessels were supplied with megaphones; they were able and it was their duty to communi-cats with vessels at anchor in dangerous places and warn them if they were not carrying the proper riding lights. Provided that the position of the schooners was correctly marked upon the chart, he thought there was ample room for outward bound vessels to pass them on either side. Sylvester Matthews, seaman on the "Vigilant," stated that he cut the lanyard by which the lamp was attached, but could not say definitely to what portion of the schooner's rigging the lamp had been attached, but he thought it was to a stay. The "Clan Macdonald," Official Number 106067, is a British screw steamship, built of steel, of the turret type, by Messrs. William Doxford & Sons, Limited, of Sunderland, in 1897, and is registered at the Port of Glasgow. She has two masts, two decks, is schooner rigged, and has seven bulkheads. She has a cellular bottom fore and aft, which is divided into seven ballast tanks having a total capacity of 1,972 tons. Her length from stem to stern is 400 feet, her main breadth 50 feet, and depth of hold amidships 31.54 feet. She is fitted with three steel boilers, with a working pressure of 180 bs. The machinery and boilers were constructed by the builders of the steamer. She carried boats, lifebuoys and lifebelts in accordance with the Board of Trade requirements, and is owned by Sir Charles William Cayzer, James MacKenzie, and David Rennie Thomas Barr, of 109, Hope Street, Glasgow, being the designated manager by advice received on the 19th day of December, 1898. Mr. H. J. Manchester, first class pilot for the River Mersey, and permanently attached to the Clan Line steamers, stated he left the Alfred Dock at 4.55 a.m. on 21st November, 1909, in charge of the "Clan Macdonald," bound out. The captain was on the bridge with him, and the chief officer was on the forecastle head with an Asiatic to keep a look-out. The morning was clear for seeing lights, and the wind not sufficient for a schooner to sail up the river against the ebb tide but strong enough for a schooner to have got into a safer anchorage and out of the fairway. She ought to have anchored on the starboard side of the channel. There is no rule, however, for incoming vessels to that effect. The schooner would have been out of the fairway, and had plenty of water to anchor north of the buoys. As he approached the Formby Lightship a white light was reported by the chief officer nearly ahead, and distant about a quarter of a mile. The pilot states he only saw one light in the port fore rigging of the vessel he was approaching. The "Clan Macdonald" at the time was going half speed. She passed the schooner ("Princess Louise") at anchor on the port side distant about 60 yards. The pilot did not port the helm to clear the schooner, neither did he hear any shouting from the crew. This is contrary to the evidence of the master of the "Princess Louise" and the witnesses from the Formby Light Vessel. When abeam of the "Princess Louise" he ported his helm for the Bar course, and put the engines full speed ahead, thinking he had a clear course. Shortly afterwards be heard the chief officer sing out "Sails ahead," but they were then too close to avoid a collision, and they crashed into the vessel, although the engines were immediately put full speed astern and the helm hard-a-port. He heard the crew of the schooner (the "Henrietta") shouting, and was of opinion she had no riding lights up, or if they were in position they were obscured by the head sails. The evidence of Mr. George Hayward, Captain of the "Clan Macdonald," and who has been master for the last 13 1/2 years, is similar to that given by the pilot. He was on the bridge from the time of sailing till the collision, and immediately after the accident he ordered ropes to be thrown over the bow and the boat to be lowered, but it was not in the water until 15 minutes after the collision, as it was first reported that all the crew of the schooner had been taken out of her over the bows of the steamer. The chief officer of the "Clan Macdonald," Mr. Alexander Robertson, who was on the forecastle bead keeping a look-out, stated that the schooner was not more than a ship's length ahead when he first sighted her sails and reported them. He never saw any lights from first to last. The contention on behalf of the "Clan Macdonald" was that the schooner "Henrietta" bad not exhibited the regulation riding lights, or if she did so, they were obscured by the sails. This contention is entirely disproved by the evidence of the witnesses from the Formby Light Vessel, the master of the "Princess Louise" and the survivors from the "Henrietta," and further this evidence is confirmed by the riding light taken from the wreck. (1) Did the "Henrietta" take up a safe and proper anchorage at or about 5.55 a.m. on the 21st November last, and did she then and thereafter exhibit the anchor lights required by Rule 6 of the Rules made for the navigation of the River Mersey, and were such lights, or either of them, obscured by her sails? (2) Was a good and proper look-out kept on board both ships. (3) Were prompt and proper measures taken to keep the "Clan Macdonald" out of the way of the "Henrietta," and was Article 23 of the Regulations for Preventing Collisions at Sea duly observed ? (4) What was the cause of collision and loss of life, and was every possible and reasonable effort made by those on board the "Clan Macdonald" to render assistance ? (5) Was the "Clan Macdonald" navigated with proper and seamanlike care? (6) Was the loss of the sailing ship "Henrietta" and/or the loss of life caused by the wrongful act or default of her master, and the master, chief officer, and pilot of the "Clan Macdonald," or of any of them. (1) The "Henrietta" came to an anchor at or about 5.55 a.m. on the 21st November last, N. by E. from the Formby Lightship, distant about 200 yards. Under the circumstances it was a safe and proper position and not an unusual one for small craft of this description, with a failing wind and strong ebb tide. Outward bound vessels could have passed safely on either side of her. She did exhibit then and thereafter the anchor lights required by Rule 6 of the rules made for the navigation of the River Mersey, for they were distinctly seen from the Formby Lightship, and by the master of the "Princess Louise" at anchor about 200 yards further up the river, and consequently they could not have been obscured by the sails. (2) There was a good and proper look-out kept on board the "Henrietta" but not on board the "Clan Macdonald." (3) The Court is of opinion that after the "Clan Macdonald" had just previously cleared the schooner "Princess Louise" by porting and hearing the crew shorting out to them from that vessel, that their whole attention was so taken up with the occurrence that their vessel was down on top of the "Henrietta" before they had time to look round for lights, or any other danger ahead, and that no measures however prompt or proper could then have prevented the collision. (4) The cause of the collision was the want of a good and proper look-out on board the "Clan Macdonald." It is difficult to say how the man Alfred Lacey lost his life. The mate of the "Henrietta" stated that he did not see him after they gave up their attempt to launch the boat. The master, however, said that he saw him with the rest of the hands when they were endeavouring to scramble up the rope that was thrown over the bow of the "Clan Macdonald," and that he then seemed frightened and confused. The other member of the crew, Aldwyn Richards, cook, whilst attempting to climb up the rope. was crushed between the vessels and afterwards rescued by the second officer of the "Clan Macdonald" from the water, and assisted on board by means of the rope ladder. He died the following day in hospital. Under the circumstances all reasonable efforts were made by those on board the "Clan Macdonald" to render assistance. The s.s."Clan Macdonald" was not navigated in a proper and seamanlike manner, as a careful look-out was not kept. The Court feels from the evidence adduced that those in charge, and who were carrying out their respective duties for the safe navigation of the "Clan Macdonald," did not exhibit such keenness and vigilance as regards the look-out as might have been reasonably expected of them at such a time and in such a locality. More especially does this apply to the chief officer whose sole duty was to keep a strict look-out. For this want of attention the Court censures the master and pilot, and severely censures the chief officer, but does not deal with his certificate, as in their view, the conduct of the pilot and of the master also contributed, though in varying degrees, to the casualty. FINDING of the Court of Enquiry, held at Calcutta, as to the cause of. the collision that took place in the river Hooghly between the steamers "Obra," of Glasgow, 3,496 tons, and "Clan Macdonald," of Glasgow, 1,716 tons, on the 22nd December, 1897. On the morning of the 22nd December last, the ss. "Clan Macdonald" started from abreast the pontoon at Garden Reach, off the Botanical Gardens, at 6.30 a.m. At 7 a.m. the "Clan Macdonald" was head down the Reach, abreast of Garden House Print, and about 100 feet off the northern bank (water's edge); about that time she was going 6 to 6 1/2 knots an hour. The sailing ships "Leyland Brothers" and the "Highfields" were lying moored about the middle of the river, the "Leyland Brothers" about two cables length above the "Highfields," and about the same distance below Garden House Point. The "Clan Macdonald" kept about a middle course between the sailing ships and the northern bank, and at this time she perceived the "Obra" about three-quarters of a mile from her, turning from the north towards the south bank, just below the "Highfields." The "Clan Macdonald" proceeded down the river; eventually the two vessels came into collision at 7.10 a.m., "Clan's" time. The "Obra" was at anchor between the "Highfields" and the "Leyland Brothers," and at about 6.30 a.m. she weighed her anchor, and went towards the northern bank so as to back down below the "Highfields" to effect a turn. She commenced to turn on getting below and clear of the "Highfields." At this time she appears to have seen the "Clan Macdonald" coming down the river, above the "Leyland Brothers," in the immediate neighbourhood of Garden House Point, and about half a mile off. 1. That the "Clan Macdonald" did blow one blast of the steam whistle to indicate that she was directing her course to starboard, and that shortly before the collision she hailed the "Obra" to go ahead full speed. 2. That with reference to the stern movement of the "Obra," as viewed from the "Clan Macdonald," we cannot but help arriving at the conclusion that the "Obra" was very nearly stationary while performing or trying to effect a turn by the action of the propeller when going astern, and her port helm when going ahead, which would, by putting her hull across the river and throwing her stern up the Reach, make it appear to the "Clan Macdonald" as if the "Obra" was going astern; and although the "telegraph" of the "Obra" had been put to "full-speed ahead" two minutes previous to the collision, we nevertheless are of opinion that the "Obra" was only just beginning to move ahead a few seconds before the collision. 3. That the "Clan Macdonald" came down parallel to the north bank, until the moment she blew the blast on her steam whistle, when she put her helm hard-a-port, and began to incline her head to starboard. 4. That the "Obra" was at the moment of collision closer to the northern bank than calculated upon by the pilot when turning that vessel. We further consider that the captain of the "Obra" was also mistaken in the distance, and that the "Clan Macdonald" did not materially alter or shorten her distance to the northern bank, although her helm was put hard-a-port. 5. That the "Clan Macdonald," on her way down the river after turning, did attain a speed of 6 to 6 1/2 knots an hour by the time she got to the "Highfields," and that she was only going at the rate of 3 to 3 1/2 knots when she struck the "Obra." We do not believe the "Obra" was moving ahead at the rate of a knot or a knot and-a-half an hour. 6. The conclusions the Court have arrived at as to the causes of the collision are, the close proximity of the "Obra" to the northern bank, leaving bare room for the "Clan Macdonald" to pass under her stern, with the probability of the bilge touching or taking the northern bank, and also in consequence of the speed with which the "Clan Macdonald" closed in on the "Obra." just shortly before the collision. 7. With regard to the action and conduct of the pilots on board their respective vessels, the Court is of opinion that an error of judgment has been committed by both of them: Mr. Anderson, the pilot of the "Clan Macdonald," in not coming down at an easier rate of speed after turning round, and when he found the "Obra" manÅ“uvring;. and Mr. Hudson, the pilot of the "Obra," in remaining so close to the bank, when turning, as to prevent the "Clan Macdonald" from passing under the stern of the "Obra." But, taking all the circumstances of the case into our consideration, we do not think that there has been anything more than an error of judgment, and not such as to be tantamount to negligence, carelessness, or unskilfulness on the part of either of them. We find that from the time the collision became imminent to the time of actual contact everything was done by both pilots to minimise the seriousness of the catastrophe. 8. We are also of opinion that the captain and officers of both steamers carried out their duties and other orders given to them promptly. The engines, steering apparatus and gear connected with the proper navigation of both vessels, were in good order and condition, and all orders transmitted to the engine-room were carried out in as prompt a manner as was possible. Lastly. We consider that had the ships "Leyland Brothers" and the "Highfields" not been moored where they were that morning, and that the steamers had a clear Reach, the "Obra" would have done a better, a quicker, and an earlier turn from below Garden House Point, and so would have been out of the "Clan Macdonald's" way, and the "Clan Macdonald," with the same favourable circumstances, would have availed herself of the clearest side of the Reach, had she come upon the "Obra" by turning quicker. With the "Obra" in sight, as she would have had, and with the Reach clear, the chances are the "Clan Macdonald" would have waited for the "Obra" to accomplish her turn before turning herself. W. A. BONNAUD, Offg. Chief Presidency Magistrate. F. D. BELLEW, Licensed Branch Pilot. W. R. WRIGHT, Asst. Marine Supdt., Asiatic Steam Navigation Company. This was one of the first 'turret ships', a revolutionary new design which could carry more cargo and at lower cost than conventional steamers. Sir Charles Cayzer bought thirty-five turret ships giving the Clan Line a considerable commercial edge over its competitors.